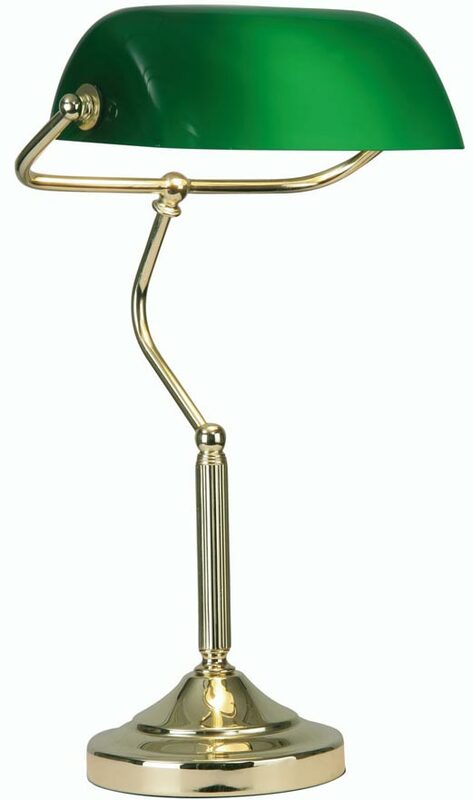 Circular gleaming polished brass finish deep set base, with central stem supporting the tilt adjustable classic green banker shade. The centre stem has a ridged detail with a curved arm that supports the traditional green glass cowl. The shade inner is finished with a white reflective coating to bounce the light straight down on whateveryou are working on. The classic polished brass bankers lamp in a style of desk lamp that never seems to age. This is a lovely stylish lamp that will dress the traditional desk top with a nostalgic presence. Fitted with a convenient inline rocker switch. Whether you are a Butcher, Baker, Candlestick Maker or indeed a Banker we all need illuminations. Here we’ve several traditional banker styled lights featuring the iconic lamp shade in both a contemporary or traditional style.